Provide comfort for the family of Offie Jarrell with a meaningful gesture of sympathy. 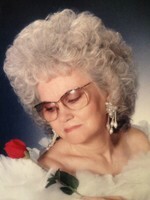 Offie Jarrell, age 87 of Dana, died Saturday April 6, 2019 in Pikeville, KY. She was born March 19, 1932 in Harold, KY. to the late Lee & Della Boyd Kidd. On December 20, 1946 in Harold, KY., she married Joe Jarrell who preceded her in death. Offie was a member of the Sammy Clark Branch Free Will Baptist Church and a homemaker. She is survived by 2 sons; Steve Jarrell of Pikeville and Danny Jarrell of Harold, 1 daughter; Glenda Jarrell of Dana, 2 brothers; Hershel Kidd of Dana and Harold Kidd of Dana, 2 sisters; Gail Harvey of Honaker and Phyllis Newsome of Frankfort, 12 grandchildren and 21 great grandchildren. Friends may visit the Sammy Clark Branch Free Will Baptist Church on Monday from 4 P.M. until 11 P.M., on Tuesday from 12 noon until 11 P.M., and on Wednesday from 9 A.M. until time of services. Funeral services are scheduled for 1 P.M. Wednesday April 10 at the Sammy Clark Branch Free Will Baptist Church with Shane Powers and James Allen Akers officiating. Burial will follow in the Boyd-Kidd Cemetery at Dana, KY.
To send flowers in memory of Offie Jarrell, please visit our Heartfelt Sympathies Store. We encourage you to share your most beloved memories of Offie here, so that the family and other loved ones can always see it. You can upload cherished photographs, or share your favorite stories, and can even comment on those shared by others.